Remember last week when I complained about the “lakeside” camping at Government Wash that is anything but lakeside these days? 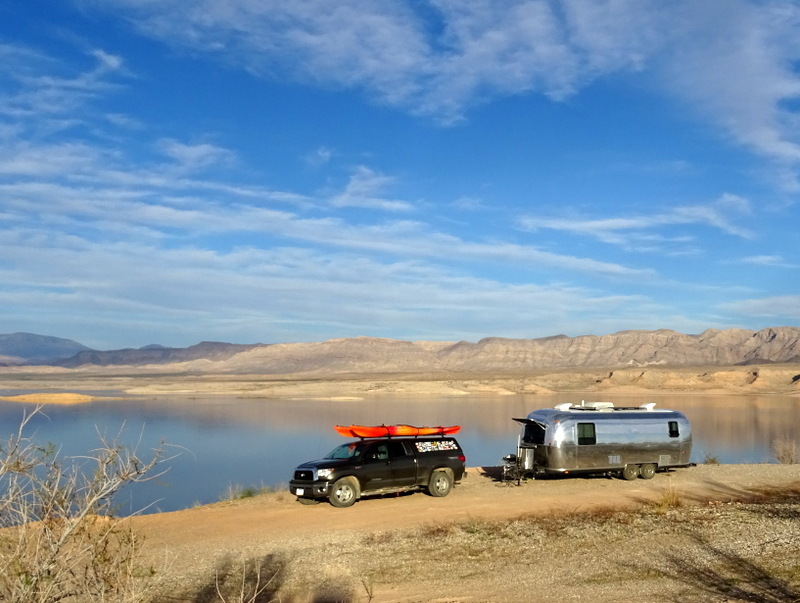 Well, I can now confirm that despite the record low water, it is possible to park your rig right on the edge of Lake Mead. 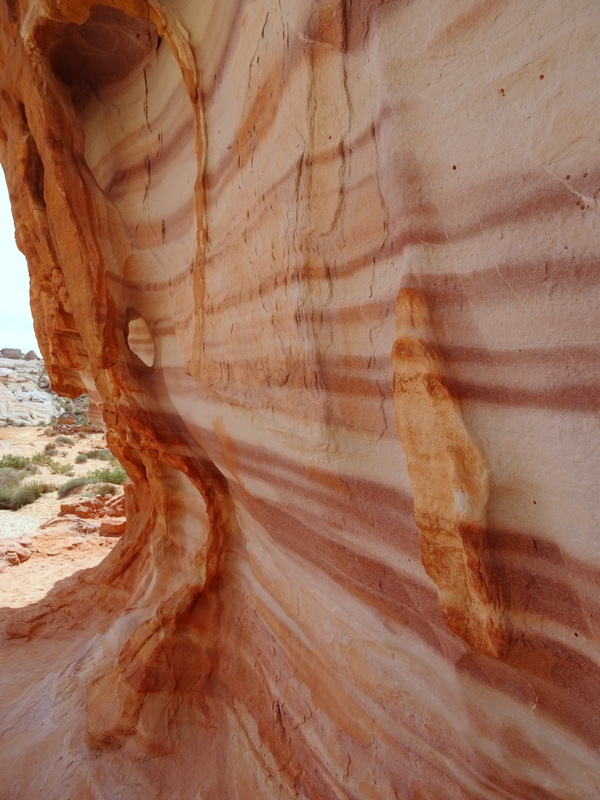 This scenic spot is called Stewarts Point and it’s located on the Overton Arm of Lake Mead way up at the northern end of the lake. 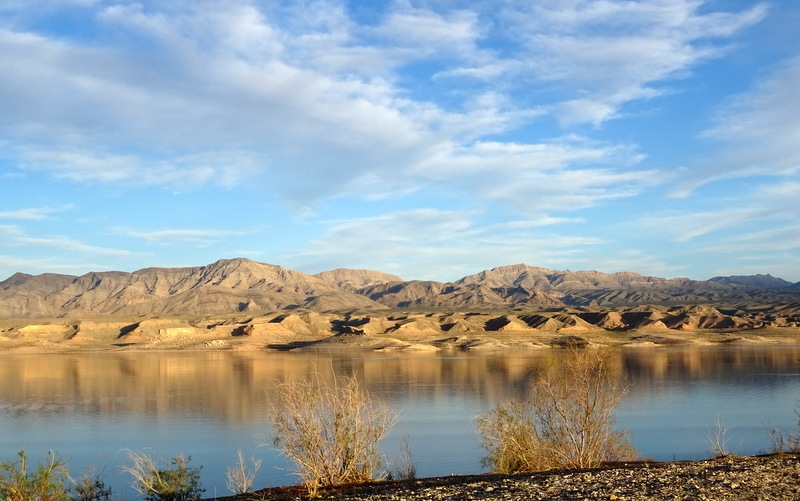 The area is inside the Lake Mead Recreation Area, and as such free camping is allowed with a 15 day limit. There are no facilities here (aside from one pit toilet), and the nearest services are about 20 minutes away in Overton where you will find a small grocery store, a few gas stations and not much else. But the Verizon signal is strong, the views outstanding, and the crowds non-existent. The very best spots here require navigating a maze of narrow roads with some bumpy spots, but nothing that requires 4WD (unless you venture way to the right where you will encounter some loose gravel and soft terrain). 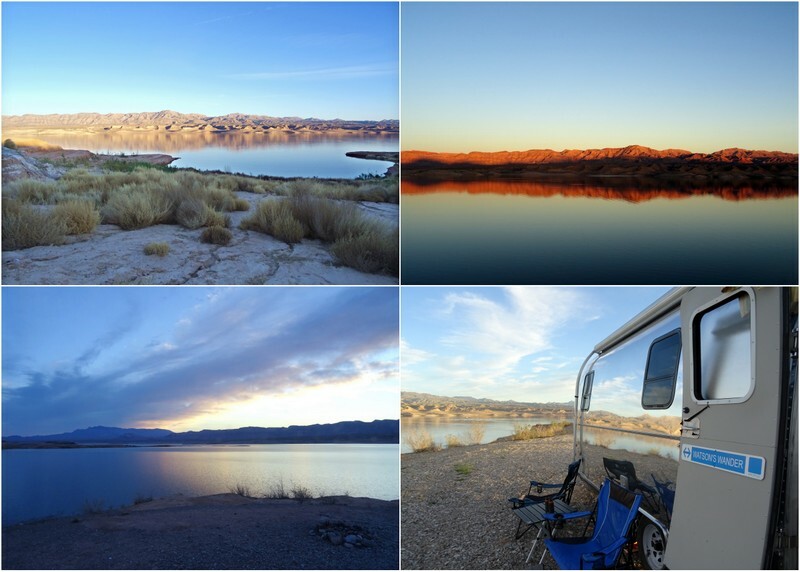 It’s also possible to find a perfectly nice spot without going far from where the main road ends and the official boondocking area begins. 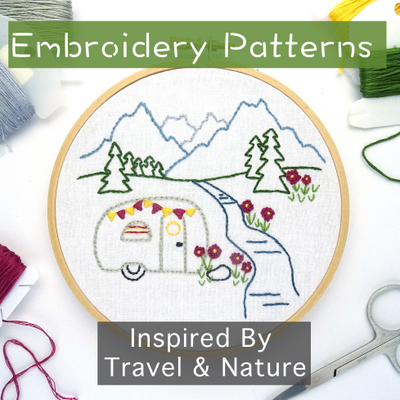 While I am calling this lakeside camping, all the spots are high up on a bluff overlooking the lake, which means you won’t have water access right from your site. But you can see it, and that’s good enough for us. 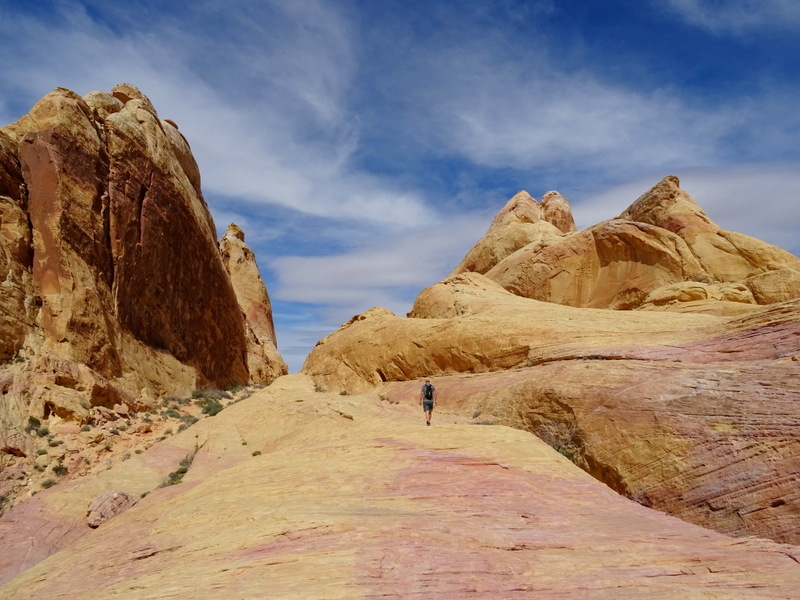 We stayed for a whole week and only left once to explore the nearby Valley of Fire State Park. With so much beauty right in our back yard there was simply no reason to go anywhere. We also got the kayaks in the water one afternoon. There is no boat ramp here, and the road down to the water is a crude, rutted, steep dirt trail not suitable for most boat trailers, but we did see a handful of families and fisherman with small boats drive down to the shore and somehow get into the water. We figured if they could do it so could we. 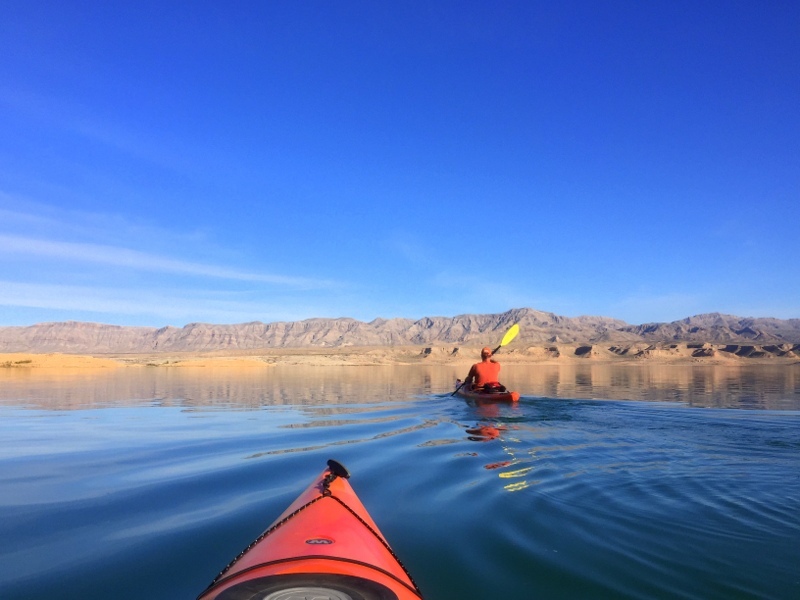 With calm water, temperatures in the mid-80s, and very little boat traffic this was some of the best kayaking we’ve done in a long time. 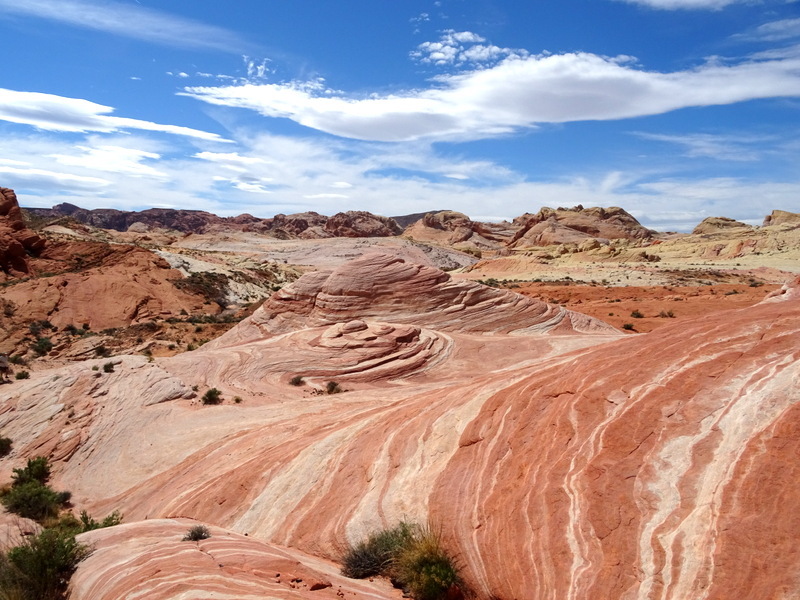 On Saturday we drove over to the Valley of Fire State Park for some hiking and red rock gawking. 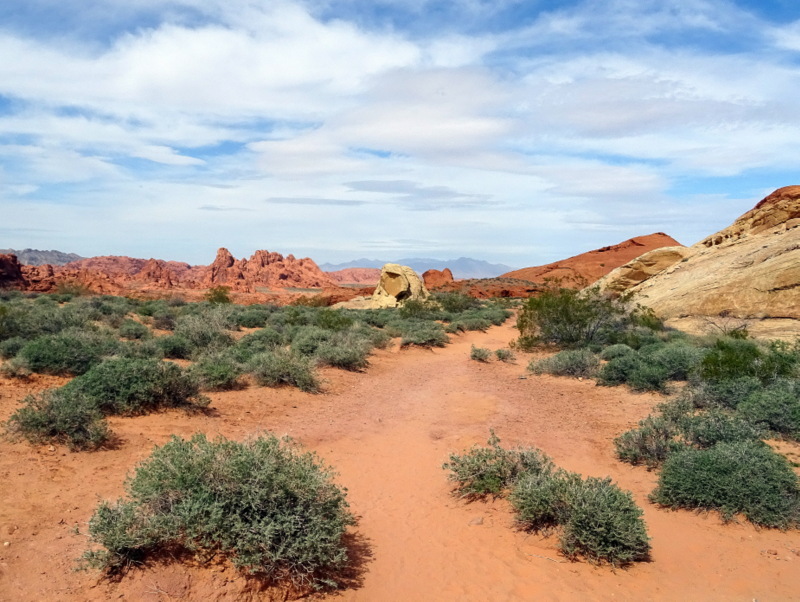 We’ve been hearing about this park for years, and while initially disappointed that we couldn’t stay in the park (not a strong enough cell signal), in the end a single day trip was enough time to drive through the entire park and tackle two small hikes. We started with the Fire Wave trail. Like most hikes in the park this one is short (1.5 miles round trip), and traverses through some really spectacular scenery ending at a wavy red rock formation. Next we hiked the White Domes Trail. 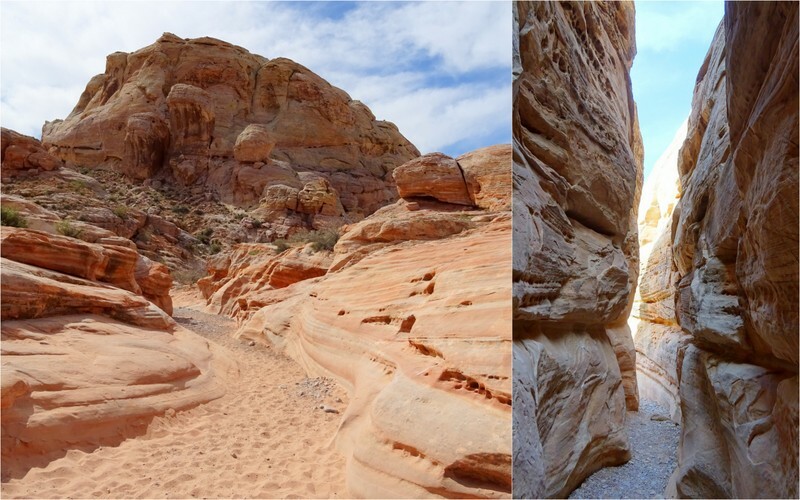 At 1.25 miles this loop trail makes up for its lack of distance with towering sandstone cliffs, brilliant colored rocks, and even a short slot canyon. After hiking we drove around the rest of the park, but I wasn’t in the mood to take any more photos, or get out and fight the crowds to see the petroglyphs, the Beehive rocks, or anything else on my “must see” list. Sometimes playing tourist is a tiring job. We also drove past the campground, and while it looked nice tucked back in the rocks, there was no way that it was better than our free spot by the lake. 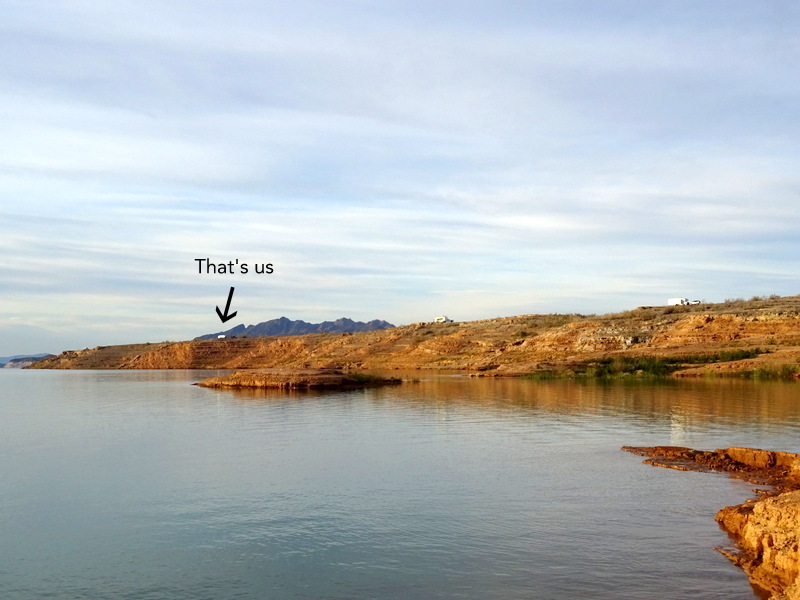 So that does it for Nevada and Lake Mead. On Sunday we packed up and headed east into Utah where we plan to spend the next few months enjoying one of our favorite states. Get ready for a LOT more pictures of red rocks. Next time skip Govt Wash and try 8.0 mile road. 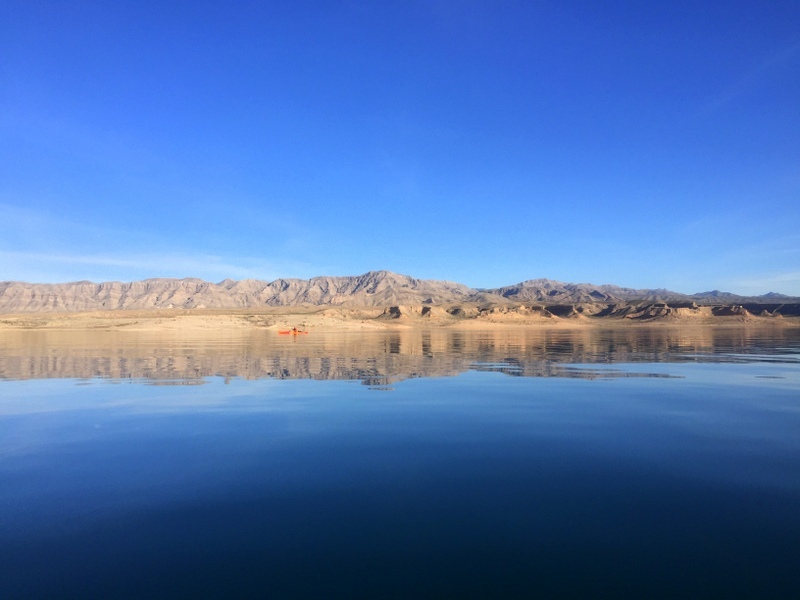 Not as many people, closer to Callville Bay CG and better views. Still no access to the water unless you drive down this gnarly hill. Agreed! We walked over there one day and found some really nice spots overlooking the lake. Will definitely check it our next time. Oh how I wish I was camping now. Looks so beautiful and peaceful. It was peaceful. Hope you get out there soon! Just love this spot! We spent 10 days there a couple of years ago. You captured it beautifully! I found your review of the spot and it definitely helped us know what to expect. I’m really surprised this is not a more popular spot. 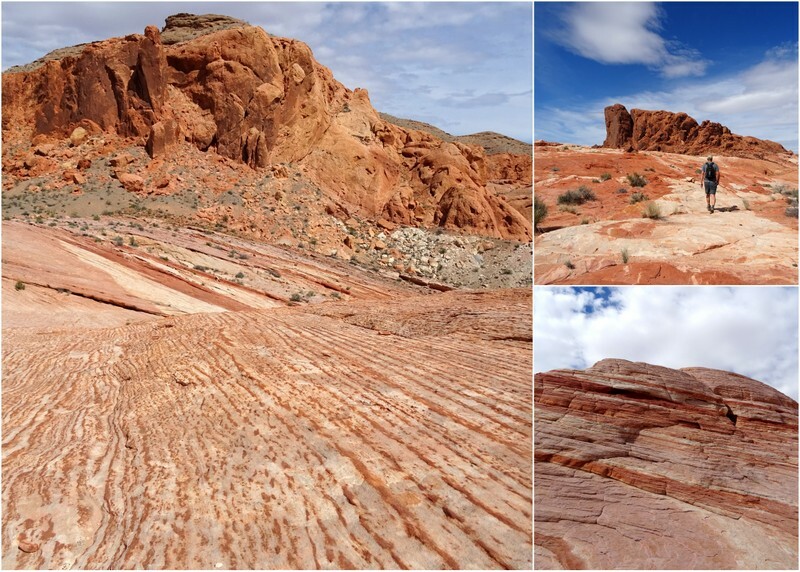 Valley of Fire has long been on our list — cannot figure out why in the world we haven’t made it there yet. But wow, your photos…..it’s now moved up closer to the top of our list. Your kayaking looks pretty sweet, too! 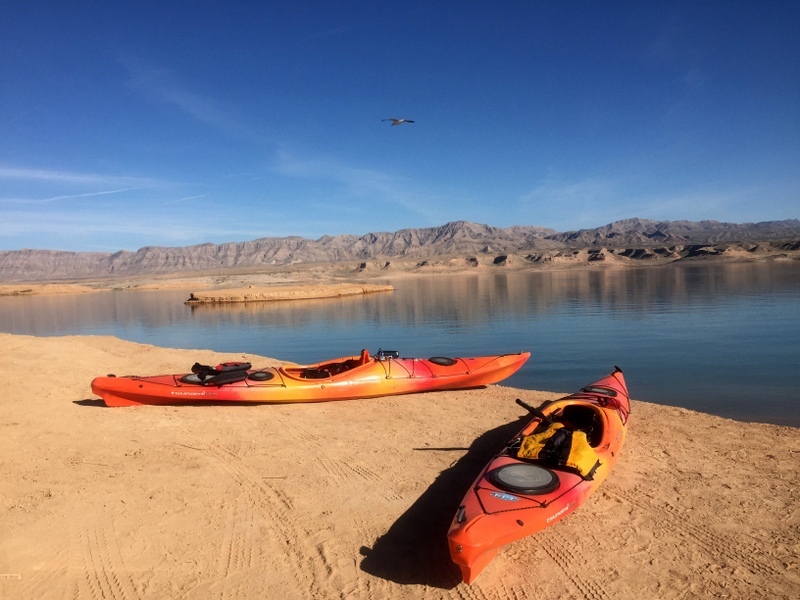 Your kayaks are the perfect color complement for those blue waters and skies.